Towards the end of today's regular meeting, I was surprised to receive an award! Shown below is our statuesque VP for Education, Krissie, awarding me the Toastmasters Pathways Pin. 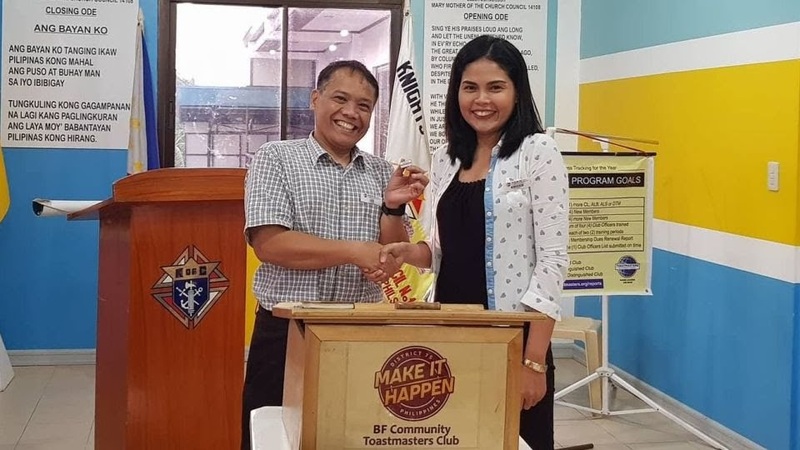 For our club, this is the first time the pin is given out and is awarded to the club member to reach Level 1 in any Pathways path. I completed my Innovative Planning Level 1 speech in the Feb.17 Toastmasters meeting and received the INNPLAL1 or IP1 award online the following day, Feb.18. INNPLAL1 or IP1 is my third award for the Toastmasters year, 2017-2018, and qualified me for the Triple Crown Award 2017-2018. But first thing's first. As is usually expected during the first Toastmasters meeting for the month (we have 2 in a month), we had a Club Officers' Meeting. And today, we held the Club Officers' meeting at the Kaijo Steaks and Ramen Restaurant along Gloria Diaz St. I had the Tantanmen ramen for my lunch. Kaijo Restaurant is farther away from our previous meeting place which is Mystic Brew. It's actually near the old club meeting venue of BF Community which is KEI Restaurant. Since this venue is farther away, we had to finish the Club Officers' Meeting earlier to make it to the regular club meeting at Mary Mother of the Church Parish (MMCP). At the regular club meeting in MMCP, I delivered the second and last speech (or talk) for my High Performance Leadership Project, "Presenting the Results". Unfortunately, we didn't have the LCD projector for my slides. According to the Parish Office, the MLCP group of the parish beat us to its reservation. So I just used Leah's laptop for a semblance of a presentation. I was the Toastmaster of the Day and also evaluated Duchess for The Folk Tale advanced speech project. 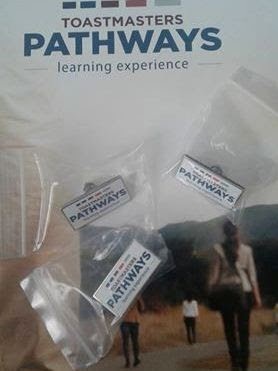 Back to the Pathways pins. I believe there are 3 pins and are part of the kit that was given to all clubs when Pathways was rolled out. I think, originally, the idea from TI was for a club to award one Pathways pin to a Toastmaster who started Pathways and has chosen a Path. 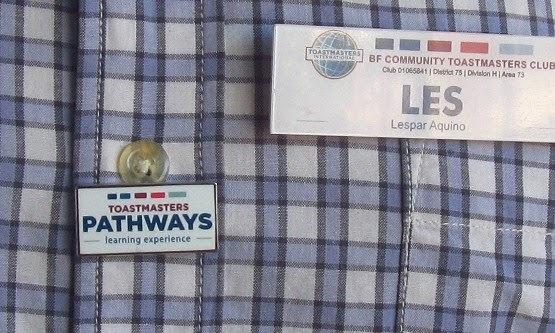 In other clubs, the pin is awarded once a Toastmaster has delivered his Ice Breaker speech in Pathways. This is the Toastmaster Pathways Pin that was awarded to me. I wasn't sure where to put the Pathways Pin (deluxe clutch type) and I so just put it in one of the front buttonholes of my shirt. This way, the pin doesn't have to pierce clothing. You can see how the design on the Pathways Pin matches that of our club name tag pin that Club Pres. Leah gave us in the Jan.6, 2018 Toastmasters meeting. Here's another photo of me and Krissie, this time, beside the new club banner that President Leah gave the club. It's the first time for us to use the club banner. With the new banner spine I improvised at its top edge, we're now able to hang it. Next to the club banner tarp in the above photo is the chart we use to explain the Table Topics speech patterns. I fixed the misspelled word "PATERNS" on this tarp and became one of my DIY projects. A bit of a photo-op after the meeting. One of our members, Dr. Rey Pepino, wrote a book entitled, "Lord Over All" and is giving each one of us a copy. It turned out to be a book-signing event. Here's a final group pictorial beside the new banner. 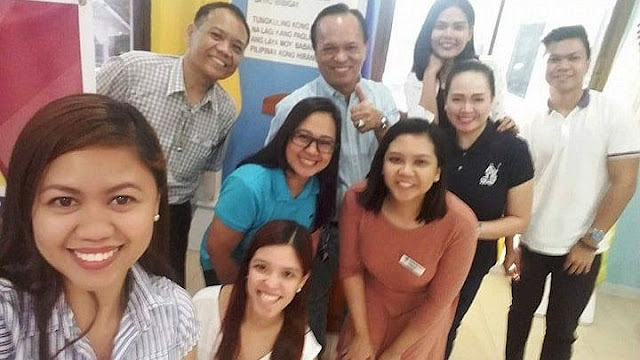 From L-R: Duchess, me, Pam, Rey, Leah, Krissie, Ching and John Paul. Thank you, Dr. Rey, for the book, and thank you all for another productive meeting!